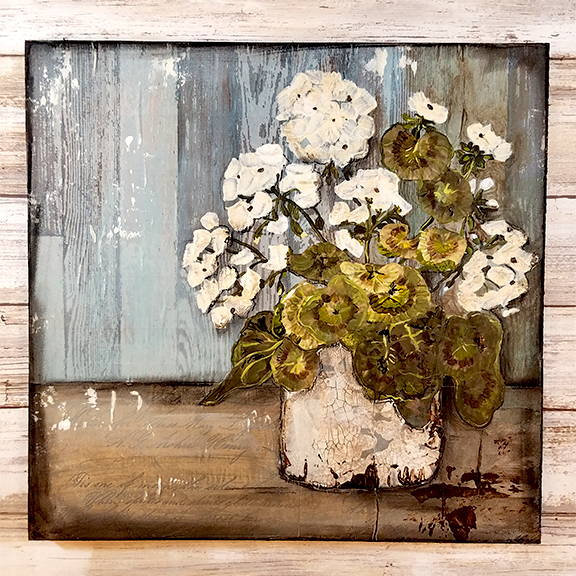 Nothing says summer to me than geraniums, so I thought it would be fun to paint and create a farmhouse style floral. Using Americana Premium and DecoArt Media Gesso I made the petals thick and chalky and the Crackle Paint added just the right grunge and texture to the vase. Finishing with Antiquing Cream gave it a rustic feel. I hope you enjoy the video. Wow! This is such a stunning mixed media painting! Thanks for the video tutorial. It was fun to watch your process! Beautiful! The details are incredible! OH my gosh !!! I can't wait to try this ! No way do I have any artist talent close to you but you always give me so much inspiration . Your blog , your artists are so much fun to watch and the videos are always amazing. It sounds sappy but I truly love it . It all gives me such peace thank you again and again .